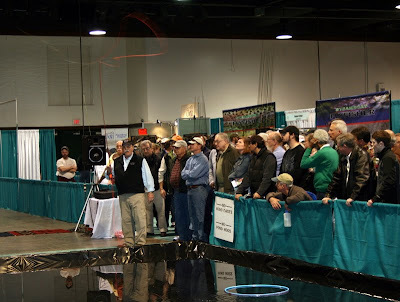 This was my first experience at the Fly Fishing Show. I liked it a lot but I came away a little confused. I was told before hand that a lot of vendors were going to have bargain bins with amazing deals. There wasn't much of that. A few places had 50% off apparel but it was pretty picked over and odd sizes. There were some good deals on flies. An example was a dozen flies for $10. I was puzzled that more vendors didn't have good deals. The market they are selling too was literally coming to them. The best part was probably the speakers. There were professional casters and fly tiers. 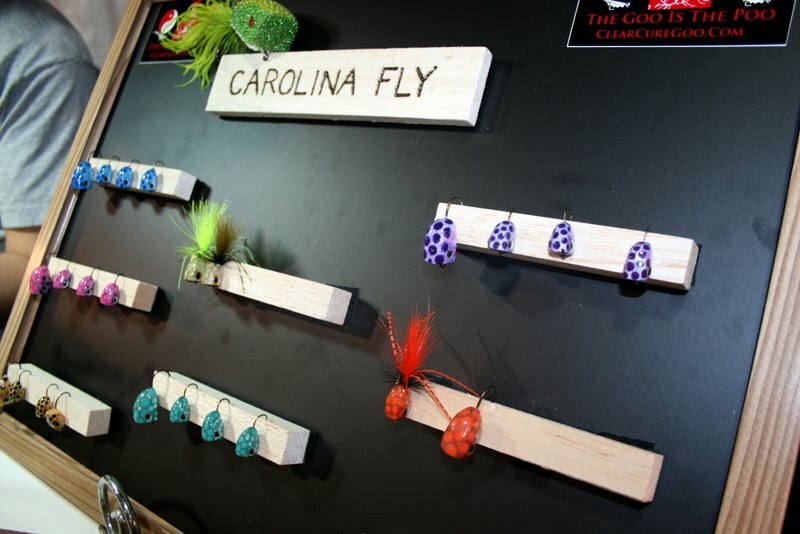 Bob Clouser gave a casting instruction and Whitlock had a presentation on deer hair flies. Both drew big crowds. It was interesting that Clouser had different casting advice than someone who gave a presentation just a few hours prior. They almost contradicted themselves. All I took away was casting is really about personal preference and what works for you. There was a nice casting lane in the middle of the show where people could test out rods. You could see people lined up around the sides to not only watch the action of the rod but also critique the caster. There were targets laid out in a pool for people to cast too. Some people got their line stuck in the rafters up above. I think the embarrassing experience made other people reluctant to try casting. I have to admit I was one of those people. It has been so cold and all this fly fishing stuff made me just want to cast a rod. I finally gave in and made my way to the casting lane. I was sure I was going to do something stupid. Luckily I didn't and made a few nice casts to the targets. I never really knew who Dave Whitlock was but after seeing his art, fly tying instruction and checking out some of his books I was impressed.. 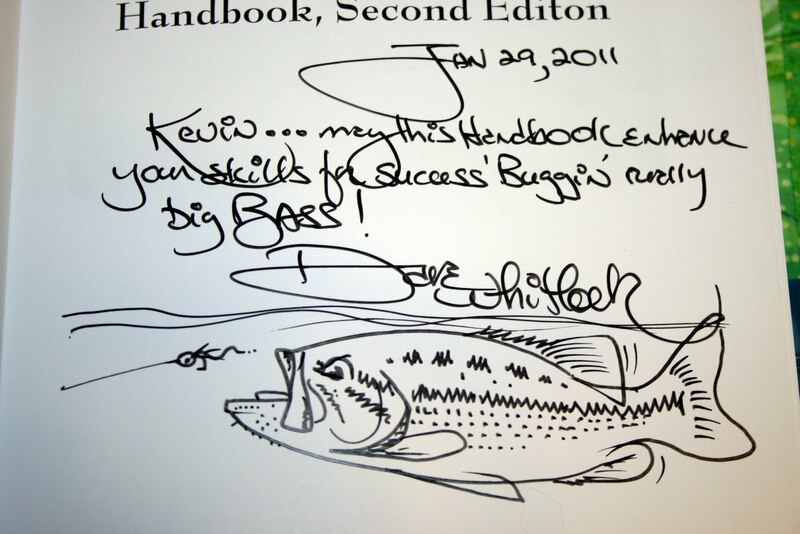 I decided to buy his book about Fly Fishing For Bass. 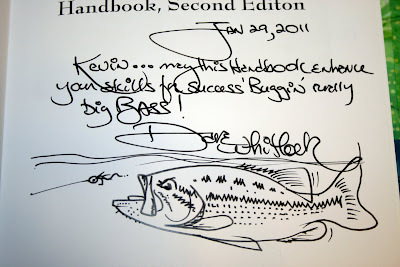 It's a book I need since I rarely catch a lot of large mouth. Dave kindly autographed it and I was really happy with what he did. I watched Dave do this for several other people and it was easy to see that he not only loves fishing but appreciates his fans. He doesn't have to do any of this. He could go to a show and give a talk take his money and leave. I'm sure he doesn't even need money, he's in his 70's and could probably spend the rest of his days fishing. Instead, he chooses to autograph books, give free trying instruction presentations and will talk and share his knowledge with anyone. The Triangle Fly Fishers had a great presence at the show. There was a lot of interest. This is what the club needed. Raleigh-Durham is a pretty big area and it's difficult to get exposure to the right people. 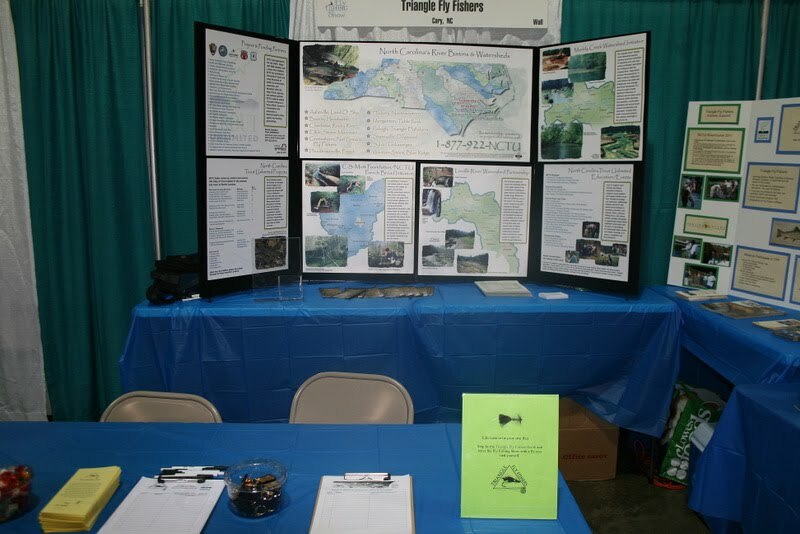 It seemed people were looking for the same thing, fishing information for local waters. For some reason warm water fly fishing is not getting the same recognition as cold water trout fishing. Our club is trying to show people that you don't have to drive 3hrs for great fishing, there is great rivers in your own backyard. We'll see how the response is in the next coming week. There was also a lot in interest in fly tying. 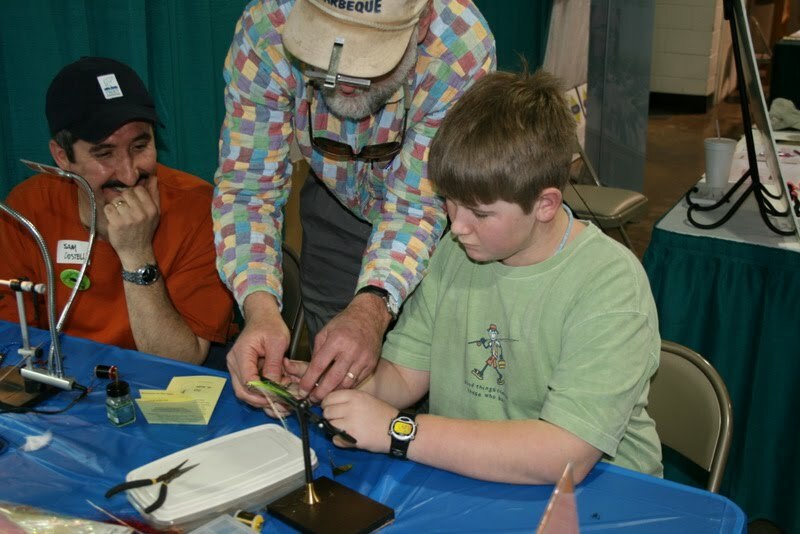 Our club had a booth set up for beginning fly tying where people could tie a wooly bugger themselves. The booth was always full and kids seemed to really enjoy it. It was nice to talk to other organizations and groups. Thomas from Carolina Fly ties balsa wood poppers that are amazing to look at as I'm sure they are to fish. 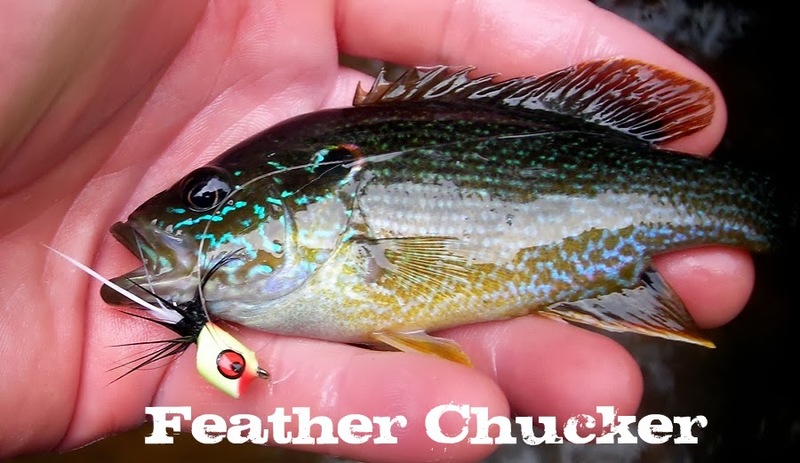 He is a native from Cary, NC and like most started out spin fishing then eventually moved to a fly rod. The craftsmanship of his flies is top notch. He had never heard of TFF before and after talking for awhile seemed interested in joining us. The Eno River is one of is favorite places to go and he was pleased about our club adopting a stretch. The Fly Fishing Show in general was great. It was nice to be at the booth and help spread the word about TFF. It was also fun just to talk to people about where they fished, what they tie and their philosophies on the sport. I wish my job was to talk about a hobby I love all day. 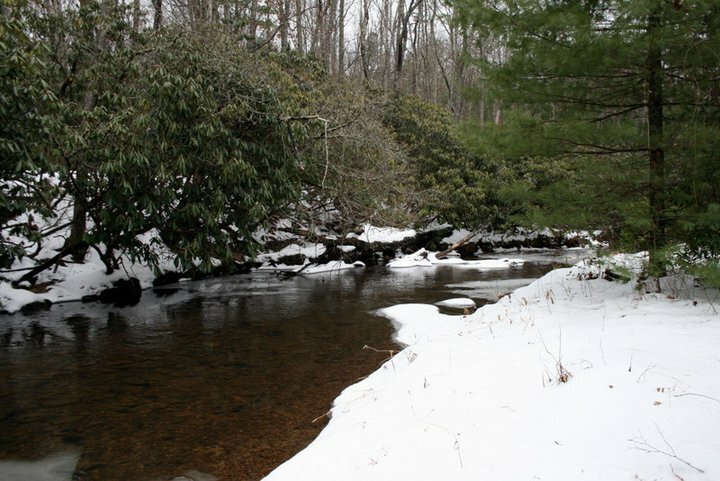 There hasn't been much to look forward to this winter when it comes to fishing except for the Fly Fishing Show. 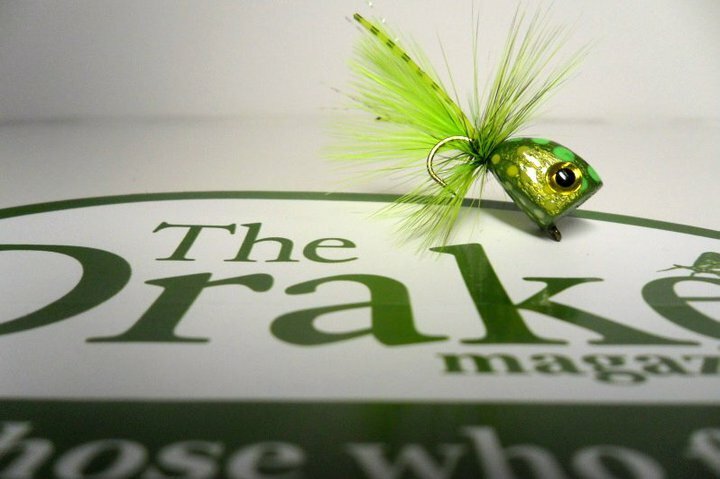 The Triangle Fly Fishers will have a booth at the show and will also have an area for beginner fly tying. Come by and say hi, then tie a bugger or two. This show should be great. 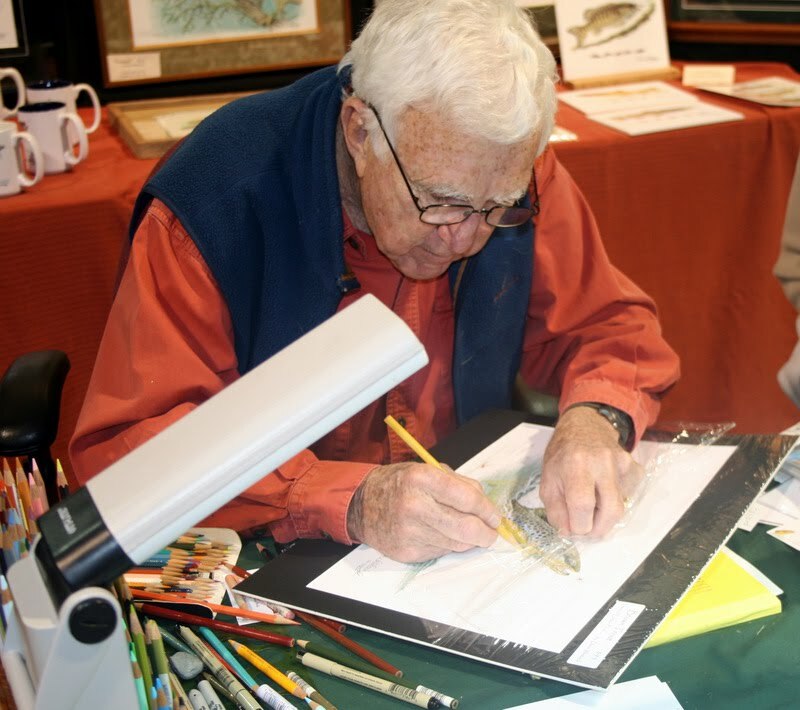 There are going to be tying demonstrations from legends like Bob Clouser and David Whitlock. There will also be casting demonstrations and various seminars and presentations on fishing techniques and destinations. This is show will be fly fisherman heaven. I made an attempt at fishing last weekend. I tried a lake that is in full sun hoping there would hardly be any ice. I knew it wasn't good when I saw a couple heron standing on top of the ice in t he middle of the lake. I walked down a dock and the water looked to be clear of ice. Then as I got closer I noticed it had a thin layer. I through a weighted fly just to see if it would break through. It bounced off the ice like it was nothing. It was amusing to cast my fly out and see it skid across the ice. Well it was fun for about 5min. Then I decided it was time to go. It's too bad too, the weather was sunny and warm enough to where you didn't need a jacket. The water will be fish-able soon. I wanted to hopefully hit a trout stream this weekend but the weather is not cooperating. Snow is even predicted locally. Looks like the wooly worm prediction was right so far. The prediction was a cold start to winter, warm middle and cold end. At least the playoffs are going on this weekend. Not only did I get out just once this December to fish. I also never made my goal of one fish per month. I tried to start the new year right this last weekend and looked into fishing a stream in VA. There was snow on the ground from a storm a few days before. The depth impressed me since the surrounding area was mostly void of substantial amounts. The snow at the elevation where the river was seemed to be 8-10inches. There was still ice covering many sections where the water was calm. I didn't want to fish with out a license so I spent the day enjoying the scenery. I'm definitely going to get a out of state and be back to check out some water near by. I didn't realize how close my father in law lived to trout water. Maybe I can get him out on the water. He received a fly rod as a gift over a year ago and it has yet to be cast.